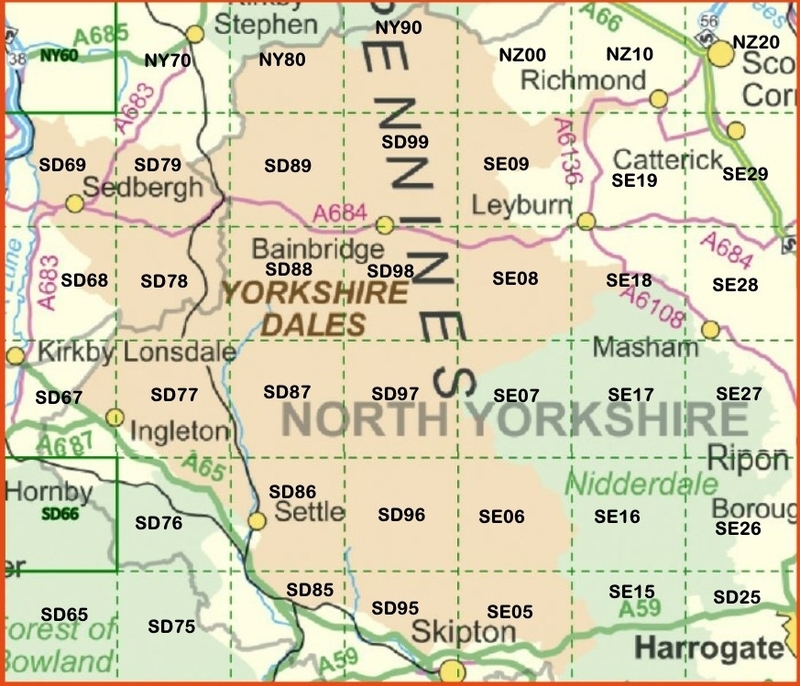 Local LIDAR jpg image downloads from the M6 to the A66 and down to the Settle - Skipton area. The local LIDAR coverage is far from complete, nevertheless it is still a good resource. This page contains links to view the local LIDAR images that are available as indicated on the 10sq km grid map below. The resolution is generally at 1 metre per pixel although in a few smaller areas 50cm or 25cm per pixel is available, however the downloads on this page are all at 1m/pixel as it has the most extensive coverage. The DTM format chosen does not show woodland or buildings. LIDAR images can be illuminated by a 'virtual sun' from any direction of the compass and at varying elevations. Two downloads have been made available with the 'virtual sun' at 210° and 300° from north (azimuth), and at 40° in elevation, so the shadows cast in the two images are at 90° from one another. As image definition is crucial and each map potentially covers 10km x 10km, the file sizes can be up to 90MB for grid SE27, down to 0.7MB for NY80 depending on the degree of LIDAR coverage within the grid. Each download is a zip file that contains a READ ME.txt file, two jpg images: the grid map and the British National Grid co-ordinates, and the two LIDAR images with the 'virtual sun' at 210° and 300° both at 40° in elevation. Please read the READ Me text file as it explains the British National Grid coordinates and the requested acknowledgment. View the images in your image viewer. You will need to zoom into the image to see the fine detail. In many image viewers the zoom control is the + and - keys (or mouse wheel control) and panning is achieved by holding a left click on the image and dragging, or by use of the keyboard arrow keys. Note: The LIDAR images are large (10,000x10,000 pixels) and as LIDAR coverage is often incomplete within the grid, it may initially appear empty! Just pan up and down or left and right, or zoom out to find the LIDAR data. The map indicates the LIDAR image downloads that are available in the table of links below the map. For coverage further north up to Kielder see this page. Thanks to openstreetmap contributors and Data.Gov.UK for the data which was processed by Stephen Eastmead.